Kanye West appears to have opened a can of worms with his outburst at Jay Z over Kim's robbery ordeal. Now a source close to the Kardashian clan has reinforced that view saying Beyonce only tolerates Kim because of the relationship between their husbands. Beyoncé has never genuinely liked Kim'. 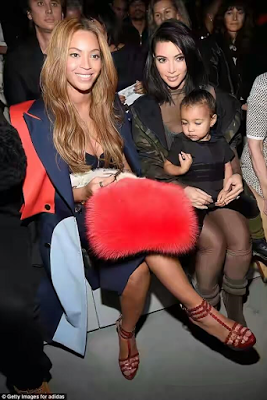 'Beyoncé’s behavior during the wedding proved she isn’t Kim’s biggest fan,' they said. Mr and Mrs Carter apparently liked 'the old Kanye' before Kim, and that they give him stick whenever he appears on Keeping Up With The Kardashians. 'She always gives Kanye a lot of grief whenever he’s done anything for the show,' the source said.